Wow. It's been a looooong time since I've done a nail post that doesn't have anything to do with books. I guess I really needed a break after hosting the nail files, eh? Haha! 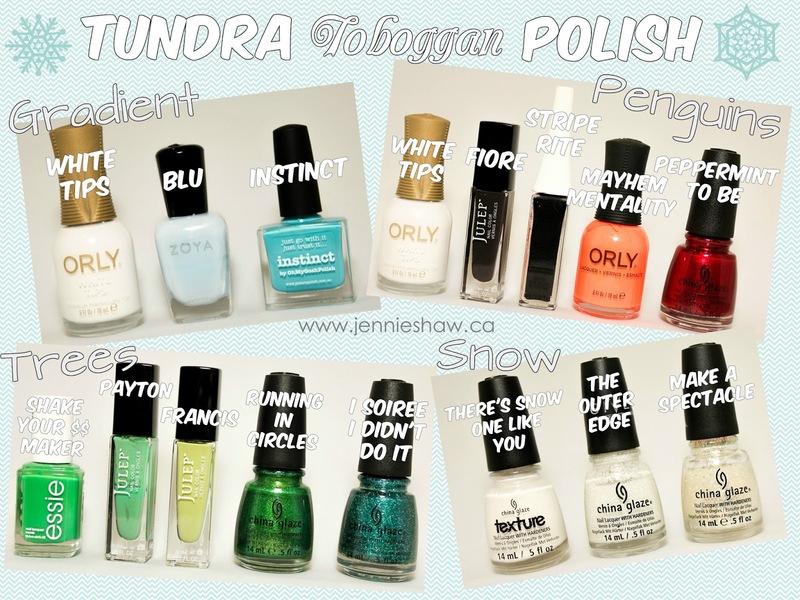 Well, the reason I felt inspired to write a straight-up nail post (besides my love for theme manis) is because there's a competition afoot, on Nail Polish Canada. Bloggers have until December 18th to share holiday nail art, for the chance to win some really awesome polish sets! WOOT FOR NAIL POLISH SETS! Ready for the longest how-to ever? Just to be on the safe side, you should probably take a bathroom break. Haha! Gradient: First, I applied one coat of White Tips. When that was dry, I used a triangular makeup sponge and applied three coats of gradient, with White Tips, Blu, and Instinct. After that dried, I used a flat nail art brush to apply the falling "snowflakes," with The Outer Edge and Make A Spectacle. A thin coat of quick-dry top coat sealed the base, and I let it dry completely before moving on. 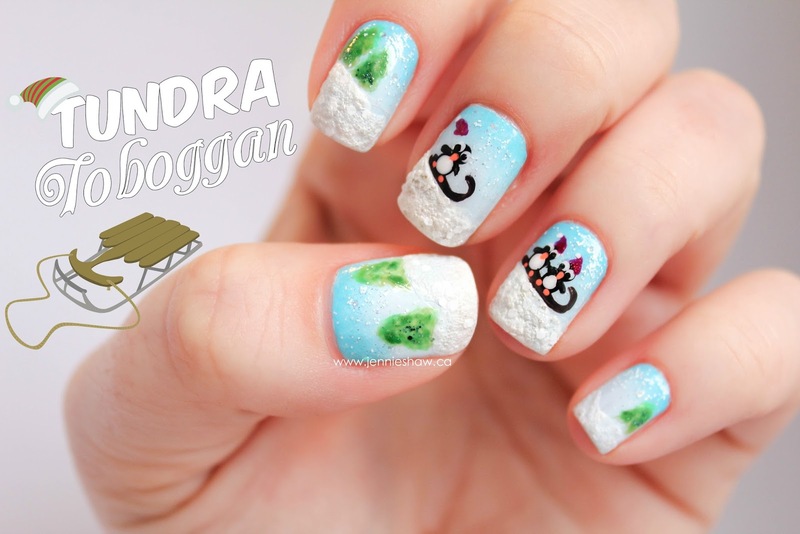 Penguins: Using a thin nail art brush and Fiore, I drew both toboggans (that aren't entirely proportionate, haha!). Then, I used a large dotting tool and Black Stripe Rite to make the bodies, heads, and arms, along with White Tips and a smaller dotting tool for each penguin's belly and eyes. With another small dot of Black Stripe Rite for the pupils, the eyes were done. The same small dotting tool I used for the pupils, I also used for the beak and feet, with Mayhem Mentality, and the santa hats are two coats of Peppermint To Be, which I applied with a thin nail art brush. Finally, a small dot of White Tips completed the hats. I applied another coat of quick-dry top coat and let it fully dry, because I was super paranoid that they'd smudge while I drew the trees (anxious nail polish enthusiast, much? ;) ). Trees: With another thin nail art brush, I layered Shake Your $$ Maker, Payton, Francis, Running in Circles, and I Soiree I Didn't Do It, until I thought they looked like actual trees. Haha! I added one more coat of quick-dry top coat and then finished off the mani with the "mountain," where I applied a thick coat of There's Snow One Like You, on the bottom of each nail. So there you have it: a tundra toboggan adventure! 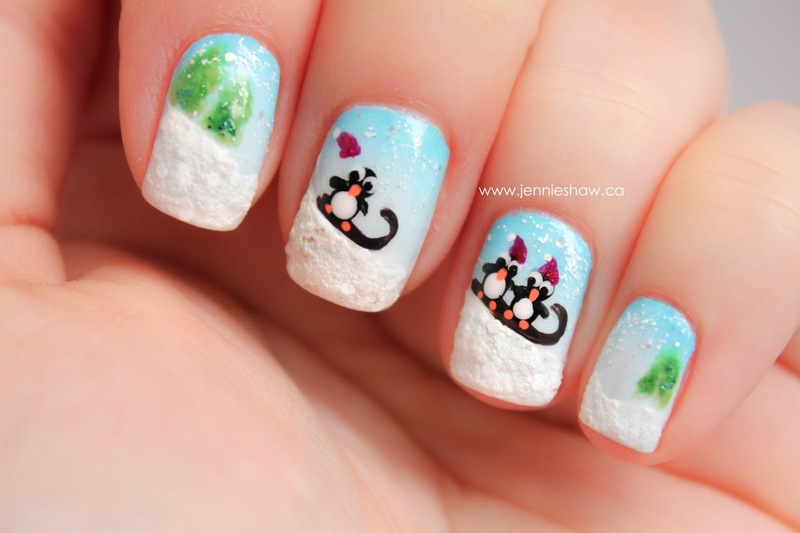 Oh man, I really love using penguins for winter nail art. And I think the santa hats are freaking adorable. Especially the one that flew off the third penguin, because he was going too fast, furiously trying to catch up to his buddies. What a story of triumph for the little penguin that could! (maybe) Haha! If you like my holiday nail art, I'd love your vote! Here's the link! And if you'd like to enter, upload your own mani, below. Remember that you've got until December 18th! Good luck (and thank you if you decide to vote for me!!)! Oh my gods. I LOVE it! That one penguin's hat flying off cracks me up. Jennie, you seriously outdid yourself with this one. I'm voting, pinning, and pining! top ten reads of 2015! book review (with tribute mani! ): why not me?